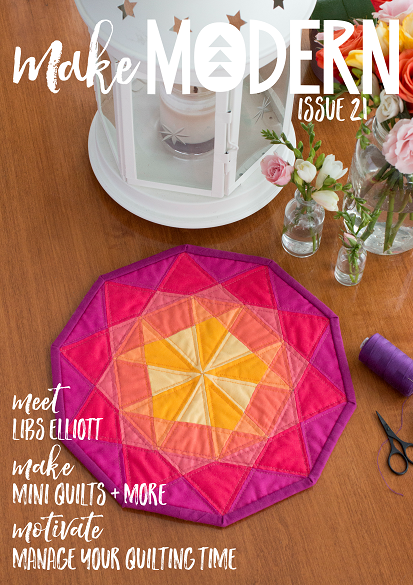 Glow is a beautiful quilt, featuring a classic style design, making it free and easy to interpret in your own way. The pictured quilt is made using a variety of fabrics, grouped in colours to create the overall design and effect. All print fabrics are by Bonnie and Camille for Moda Fabrics. The finished quilt is a great Single/Twin size at 54" x 72" finished, but can be easily adapted to a larger or smaller quilt, depending on your preference. The quilt is made from 12 large blocks, finishing at 18" square each. The quilt is ideal for using scraps and yardage from your stash to create a visually fun quilt. Additional fabric required for the background, binding and backing etc. • 7” x 15” rectangle from forty-eight different fabrics in ten colour ways - Raspberry, Red, Aqua (x2), Grey, Pink, Lemon Orange (x2), Navy, Apple Green and Teal. • 90cm (34”) Solid White fabric for the background (I used Moda Bella Solid #97).